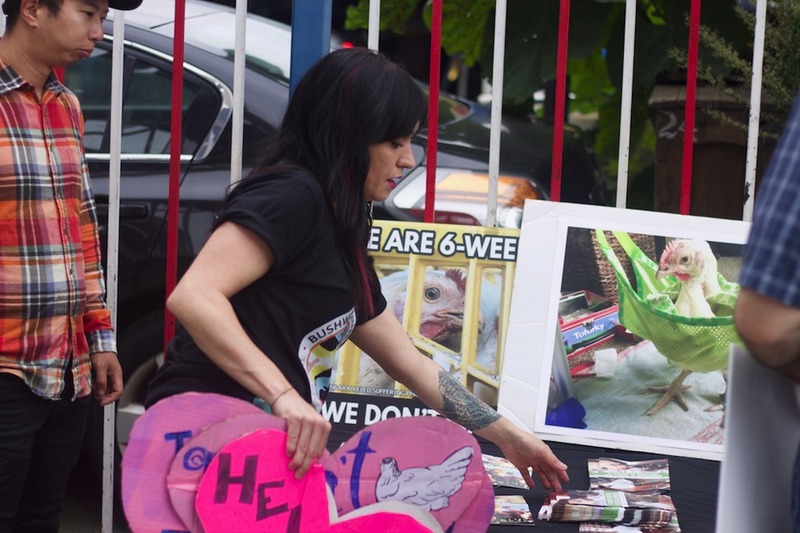 Bushwick Animal Save is expanding chapters across the city. Sarai Garcia was a dancer before she was vegan. A Pittsburgh native and Point Park grad who ended up working for a humane food distributor as a side-hustle, curiosity led her to take a look at the industry she had become a small part of. She started eating vegetarian and then vegan shortly after. With it, she found a new calling and became a full-time activist, first with Vegan Outreach and then with the Save Movement, where she has helped open one its newest chapters in Bushwick. Confrontation is downplayed and Garcia says that she even reaches out to the owners about these events beforehand. “We don’t want to close them down, we just want to talk to people about another possible answer,” Garcia says. Viveros are a relatively unique Brooklyn-Queens-Bronx cultural experience, something that even a career activist like Garcia, used to interrogating factory farms from behind their locked gates, was surprised to discover. In a vivero, you can select a still squawking chicken from a variety of cages (Kikiriki’s Live Poultry also stocks ducks and rabbits), wait ten minutes in a waiting room and then receive it defeathered, gutted and packaged in plastic bag, often still warm. “Normally, they don’t show you all this,” Garcia says. George Cardoso, a contractor in dried paint, stops by and sticks around for some of this afternoon, talking to Garcia about his own experience never feeling quite comfortable with the weekly trip to the vivero he remembers from growing up. “It always felt weird,” he says. In a strangely moving way, it is harder for the group of committed vegans to stand around the vivero than it is for the vivero to tolerate their signs and pamphlets. They want to do something for the animals, even if Garcia tries to keep their mind on the larger fight. 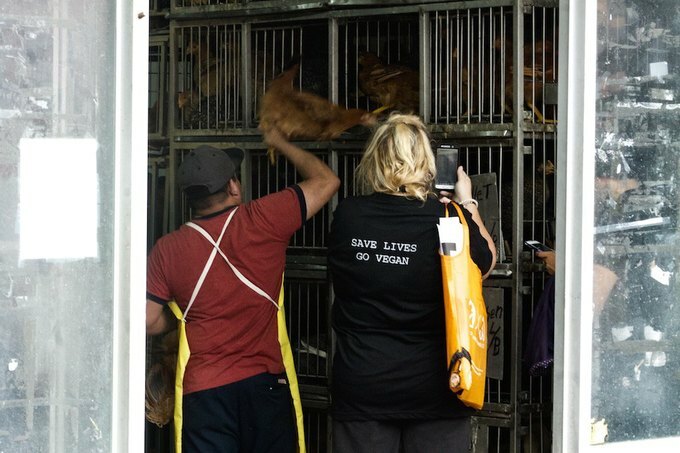 Some of the volunteers, after some time walking outside, venture inside the vivero, and look at the cages or take photographs with phones or even to offer the cluttered chickens fresh water bottle water. If any of the chicken are injured, Garcia tells me, they can also make the demand that the vivero forfeit the animal. Once, at one of her first viveros she visited in the city, Garcia was able to use this mechanism to liberate a goat. Garcia’s goal working in New York, she tells Bushwick Daily, is to establish no fewer than a hundred branches of Save in New York City. Which might be possible: she presided over the opening of another one in Sunset Park last week. But it is also to establish a kind of low-key, regular presence, right here and right by the animals. 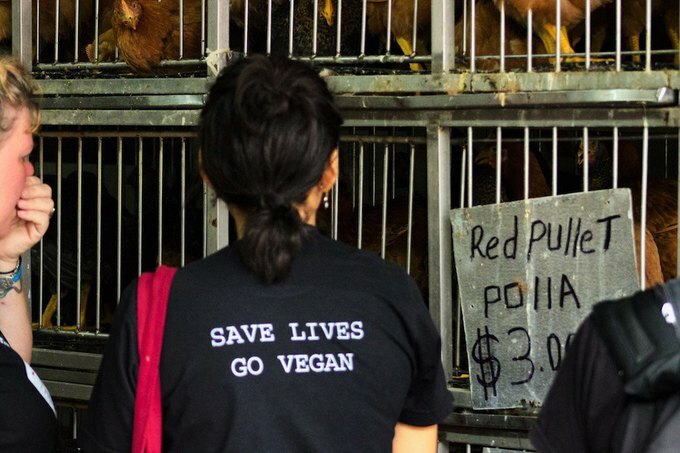 Bushwick Animal Save plans on holding vigils outside Kikiriki’s Live Poultry every weekend this month, check their Facebook page to confirm details.